When I was in Seattle this past summer I accompanied Peter on sales calls to marine dealers. We payed a visit to Armchair Sailor on Lake Union. They always have beautiful products on their shelves and a wide variety of books about place names in British Columbia to instructional books like The Book of Non-Electric Lighting (Both of which I purchased!) I thought the book about non-electric lighting might have useful information about the proper care of oil lamps. Its always good to get other people’s perspectives on products that Weems & Plath carries. As I read the introduction by the author, Tim Matson, I noticed a store name that I recognized as a Weems & Plath dealer – Lehman’s. Mr. Matson used Galen Lehman as a resource for his book. After doing a bit of research I found out that this dealer, located in Kidron, Ohio, sells alternative lighting to people for residential use. The family owned hardware store opened in 1955 and their earliest customers were the Amish people in the community. Now this low tech superstore services homesteaders, environmentalists, and people living off the grid. Lehman’s offers a full range of non-electric lamps, two of which they purchase from Weems & Plath. These brass Dutch lamps made by Den Haan Rotterdam (DHR) have names that are suspiciously nautical but indeed can be used by anyone who enjoys the ambiance of light from oil lamps on the dining table or front porch. The DHR Trawler and Berth Oil Lamps are made of the highest quality brass that is polished and lacquered to retain the bright finish. 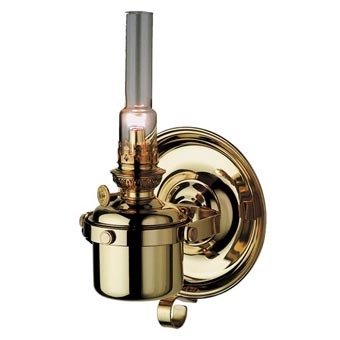 I was most happy to read several positive reviews of the DHR Berth Oil Lamp on the Lehman website that applauded the lamp’s excellent quality he reviews stated that the lamp lasts much longer than the cheaper versions, is efficient and puts out nice light. The DHR Berth Oil Lamp is one of my favorites because of its versatility. It mounts on a wall and can also be set on a table top. It can be moved without using hot pads which is not true with many other lamps once they’ve been lit viagra schweiz kaufen. This authentic replica from a 1920’s design adds class to any room or dining environment. Here’s a tip I learned from both Lehman’s website and the Non-Electric Lighting book: An oil lamp burns more efficiently when the font or reservoir is kept more than half full but not more than 2/3 full. When fuel is forced to travel a long way up the wick due to a low amount of fuel in the font there is less fuel at the end of the wick and so the wick burns instead of the fuel which results in less light. Make sure you have at least one oil lamp at home for emergencies! Our house was without power for three days following Frankenstorm Sandy and our DHR Berth Oil Lamp came in very handy! Visit the Weems and Plath website to see all the oil lamps that we offer. Many of these are available through our dealer network.